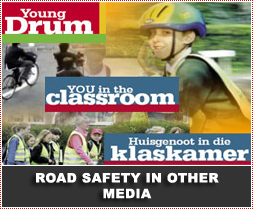 The Department of Transport has emphasized the need for private –public partnerships in creating greater road safety. Road safety awareness should therefore be an objective not only of the Department of Transport – but also of the public, educational institutions and the private sector. The Department of Transport also confirmed that they have embarked on extensive educational programs, which have reached 90% of radio listeners and 80% of television viewers. "Many South Africans know and understand what Arrive Alive stands for. However, what we need to do is to ensure that the knowledge is translated into correct road-user behavior," Department of Transport spokesperson Colin Msibi added. "We are hoping that it will make a difference." It is the vision of the development team of the web site www.arrivealive.co.za to create an information portal through which other media could also access information for distribution to a wider audience. It is the vision that others across the world - and especially other road safety initiatives across Africa would also benefit from the information.